A self-employed gumshoe like J.J. Gittes calls his own shots. As Chinatown is set in 1937, suits were de rigeur for men, but Gittes is hardly the type to rely on the gray flannel suit trope, especially in the sunny southern California locales. Investigating the Mulwray case leads Gittes to some surprising settings, but such is the adventurous life of a private eye. Luckily for Gittes, his staff – the studious Walsh (Joe Mantell) and the simpler-minded Duffy (Bruce Glover) – are always on hand. Leave it to J.J. Gittes to drape himself in gray without looking even remotely boring. His light gray gabardine three-piece suit is a luxurious summertime look that defies the conventional gray business suit. 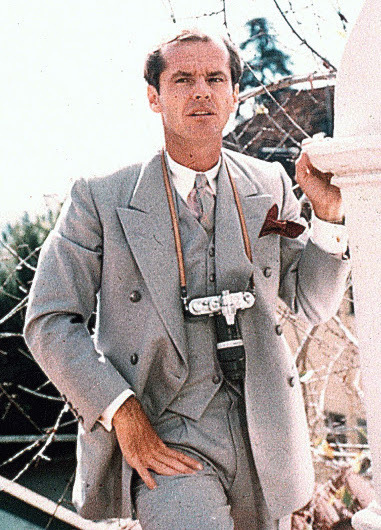 Promotional photo of Jack Nicholson as J.J. Gittes in Chinatown, following a particularly nosy night of investigations. There are four buttons on the end of each jacket sleeve. The hip pockets are jetted, and Gittes wears a dark red silk kerchief in the welted breast pocket, coordinating with the pink in his shirt and tie. Does the bespectacled, bow-tied, and buttoned-up Walsh envy or execrate Gittes’ flashy sartorial savvy? A sample of the stunning designs of costume designer Anthea Sylbert, who received her first Academy Award for her work on Chinatown, can be found online here. 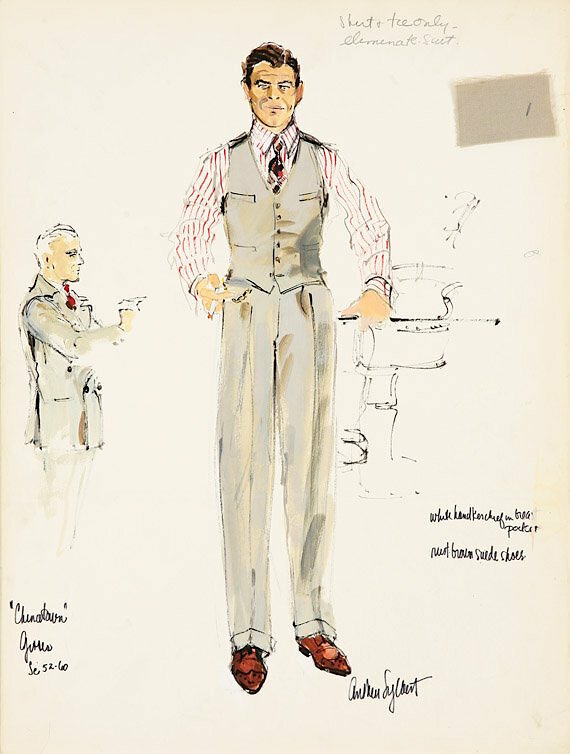 Anthea Sylbert’s original concept sketches of Gittes’ suit, revealing the details of the vest and trousers as they would be incorporated into the final product. Sylbert’s designs reveal an outfit clearly intended to be this one with a single-breasted, six-button waistcoat (or vest, as we Americans have dubbed it) with a notched bottom. Even though it’s worn open, the jacket’s full cut conceals much of the vest below it when on screen. Consulting Sylbert’s designs informs us that the vest likely has four welted pockets, a common aspect of 1930s suit waistcoats. 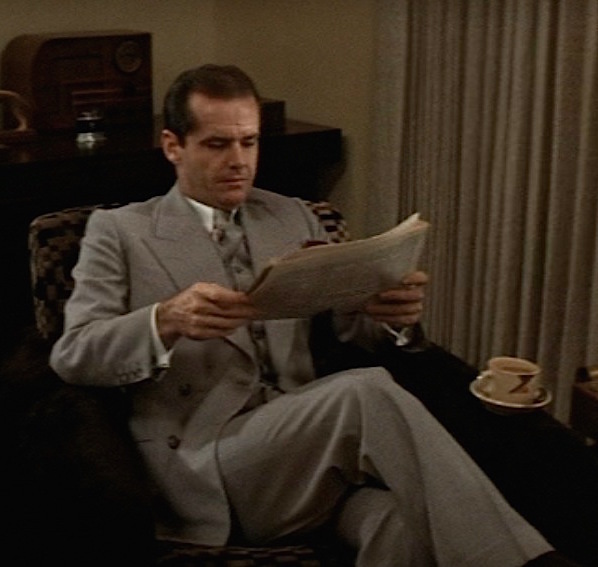 All of Gittes’ trousers have single reverse pleats, rising high to Jack Nicholson’s natural waist line with the waistline hidden under the vest of his three-piece suits. The trousers are generously cut through the legs, with 1″-high turn-ups (cuffs) at the bottoms. “Rust brown suede shoes” with a wingtip toe are stipulated in Sylbert’s concept sketch, and the cognac suede wingtips seen on screen certainly fit the bill. These five-eyelet short-wing oxford brogues appear to be the same ones that Gittes wore with his tan birdseye tweed sport jacket later in the film. He wears them here with dark socks that appear to be black. Oxford brogues in cognac brown suede are difficult to find these days, so Chinatown sartorialists may need to settle for open-laced derby-styled shoes like these fine Cole Haan “Warren” wingtips (link) or these Frye “James” wingtips (link). Then again, we know Gittes likes his Florsheim shoes so you could also check out these “Jet” longwing oxfords from Florsheim, available in dark brown or sand tan for less than $100 (link). Gittes loses his footing while trying to capture a juicy scoop. The first time this suit makes its appearance, Gittes wears a light pink shirt with a white contrast collar and cuffs. 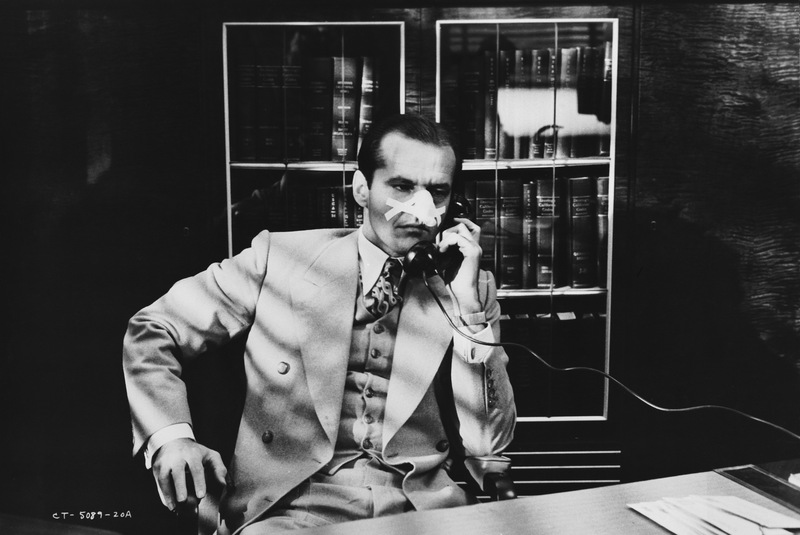 The suit’s high-fastening waistcoat covers most of the shirt, making Gittes’ long collar points and cuffs the only parts of the shirt mostly visible, a look not uncommon in the late 1930s. His cuff links are plain gold oblong links. Gittes’ black and white glen plaid tie threatens achromatism, but the tie’s pink overcheck coordinates with the shirt for a soft but effective color treatment. The morning after Gittes’ “nosy fella” incident, he shows up to work in the light gray gabardine suit, but this time in a different shirt and tie. His shirt is striped with double sets of closely-striped thin brown stripes on a white ground and the same long-pointed collar as his light pink shirt. His tie is printed in a Deco-inspired series of brown swirls in three shades: beige, tan, and brown. Gittes dials down the color for a decidedly less cheery day at work. No matter what you’re wearing below the neck, no self-respecting ’30s private eye would dare venture out in public without his fedora. Gittes wears his usual dark gray felt fedora with its wide black grosgrain band. Hat, camera, and pocket square: Gittes packs for the essentials for an afternoon at Echo Park. Gittes wears a unique vintage wristwatch in Chinatown, a flat gold-toned watch with a square dial on a link bracelet that fastens through a single-prong buckle. The watch was identified by Watches in Movies in January 2017 as a vintage Longines Palladium, a period timepiece that had been retailed by Tiffany & Co. in the 1930s and 1940s. Gittes’ watch bracelet gleams while he looks over his team’s surveillance photos of Noah Cross and Hollis Mulwray. So You Wanna Be a Private Eye? Instead, Gittes takes Duffy, the meatier-headed of his two assistants, out for a lovely late summer’s outing on Echo Park Lake. This ain’t your everyday gray business suit. For an extra pop of color, Gittes wears a red silk display kerchief in his breast pocket. Great outfit from a great movie. A shame they don’t make movies like this anymore. Everything now is “super heroes” LOL.